I have another polish from DazzleGlaze to show you today. DazzleGlaze is actually an indie that is local to me here in Orlando. Pretty cool! I went to a craft recently to scope them out and purchase some of their goodies. They have a ton of beautiful jelly glitters which happen to be my favorite finish. This one caught my eye! Night Nyx is a black jelly base filled with fuchsia and magenta glitters. Color: I love glitters like this with a black jelly base and some bright glitter. It is so hard to find them done right though, and Night Nyx is done right. A common problem with black jelly glitters is that the black jelly usually drowns out the glitter. This isn't the case here at all. There is perfect balance between base and glitter. 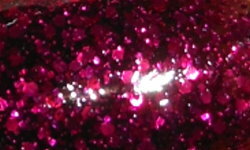 That beautiful magenta glitter shines through strong! Formula: This formula was good. The glitters came out easily. I would recommend with this polish though that you wait for it to dry completely between coats. I noticed that if it was still slightly wet applying the next coat, the polish would pool in areas and get thick. If I waited for it to dry though, I did not have this problem at all and it applied evenly. I used 3 coats above. Overall: Gorgeous polish! I love glitters like this and I wish it came in more colors. I'd buy them all! The formula was nice, but I think you'll have better results if you let it fully dry between coats. I didn't find this bothersome or a deal breaker at all though as it only maybe added another 1-2 minutes to my polish time.